Tablez targets to open 150 stores of the popular American ice-cream brand in India by 2022. Chennai, December 26, 2018: Tablez, the organised retail arm of LuLu Group International, is ringing in the New Year with the opening of two new outlets of Cold Stone Creamery, the iconic American ice cream brand, at Nungambakkam, KNK Road and VR Chennai, Anna Nagar in Chennai, today. 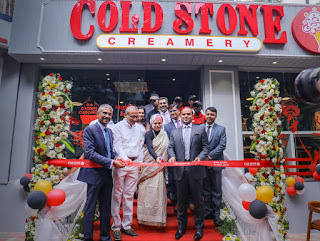 These are the 2nd and 3rd stores of Cold Stone Creamery in Chennai, with the first having opened last year at Phoenix Market City, Velachery Road. With the completion of 30 years in 2018 and its presence in 30 countries worldwide, Cold Stone Creamery is a force to reckon within the ice-cream industry. A pioneer in fresh, hand-crafted ice-cream with delicious ingredients, Cold Stone Creamery has been a trend-setter. It is well known for its innovations and its exceptional style of customer service, especially in crafting the freshest, premium and 100 percent vegetarian ice-cream products. Cold Stone Creamery offers a perfect blend of Indian elegance and international standards with its amazing in-store experience. It helps customers indulge in a wide spectrum of innovative flavours of the freshest ice-cream. Moreover, customers can tailor their ice-cream experience at the store. Cold Stone Creamery’s trained crew guide the customers through different aspects of the experience, right from choosing the flavour from the menu and suggesting the mix-ins, to choosing the kind of cone/cup to help them give you the ‘Ultimate ice-cream experience’. Crew members at Cold Stone Creamery are well trained in not just serving ice cream, but they also break into songs, dance and sometimes juggle the ice-cream to entertain their guests. Cold Stone’s delicate ‘chop-chop-fold-fold’ process ensures quick and gentle mixing to prevent the escape of air from the ice-cream. Cold Stone Creamery has “Signature Creations” and a “Create Your Own” concept where the ice-cream is customised for each guest by combining a variety of mix-ins on a frozen granite stone. The chosen flavour-scoops are put on the slab and the mix-ins - which can be of a variety of nuts, chocolates, candies, fruits - depending on the choice of the customer, are mixed with the ice cream to create a blended treat for everyone. The store also offers signature ice cream cakes, shakes, smoothies and sorbets. Tablez, the organized retail arm of the retailing giant Lulu Group International, has introduced leading global brands in F&B, toys, lifestyle and apparel to India. The company has signed master franchise agreements to bring brands like Springfield, Women’secret, Toys’R’Us and Babies’R’Us to the country. Tablez also recently signed a strategic cooperation agreement with Chinese lifestyle brand YOYOSO to bring its stores to India. In the F&B space, Tablez holds franchise rights for Cold Stone Creamery and Galito’s in addition to successfully developing two home-grown brands: Bloomsbury’s and Peppermill. Tablez currently operates more than 60 outlets globally and plans to expand to 300 outlets by 2020. Headquartered in Scottsdale, Arizona, Cold Stone Creamery® is owned by Kahala Brands, one of the fastest growing franchising companies in the world, with a portfolio of 18 quick-service restaurant brands. Cold Stone Creamery® delivers the Ultimate Ice Cream Experience through a community of franchisees who are passionate about ice cream. The secret recipe for smooth and creamy ice cream, that is handcrafted fresh daily in each store, and then customized by combining a variety of mix-ins on a frozen granite stone. Cold Stone Creamery® operates in approximately 1,500 locations in over 27 countries.